Another week of Food Service Management down, and things are starting to pick up. Nothing really new happened in week 2, as we were busy putting together the Project Charter for our management project. As usual, we completed our daily accuracy audits of the breakfast, lunch, and dinner trays. If you’re wondering what they tray accuracy audits are, they’re quite simple. We randomly choose trays going to each unit and compare what’s on the tray to what the patient ordered. We also did a Sanitation Audit of the Patient Food Service kitchen this week. Basically, we had a list of things/actions to look for regarding food safety and sanitation. I found this was a great way for us to find where things are kept/ navigate our way around the kitchen. Aside from the audits, each of us interns on this rotation had human resources case studies to complete on our own time. Other than this and the audits, we could be found in our intern office working on our Project Charter that we submitted on Friday at our weekly meeting with our project supervisor. The charter is basically an official outline/proposal for our management project. I think once we get going on the project it’s going to be really interesting! (and a lot of work). Our project is all about identifying and examining causes for patient missed meals/incomplete meals in inpatient settings at our hospital. It’s been expressed to us interns that things like interruptions at mealtime from hospital staff have an impact on patient’s ability to complete their meals, thus having an impact on their nutritional status/risk for malnutrition. Mealtime interruptions often include things like physiotherapy, patients being taken away for tests, visitors, specialist appointments, etc. So essentially we’re looking to see if it might be beneficial to suggest protection of patient mealtimes, where interruptions will not occur. We’ll also be looking at why patients may be unable to complete their meals (patient not in the right position, unable to open their food/eat it on their own/diet order set to NPO for a procedure and not changed back in time for meal service). I’m really excited about it and I think we’re definitely going to learn a lot. On Friday we sent an e-mail out to all of the inpatient RDs just to inform them of our project, that we’re interested in visiting a handful of units, and we asked them to let us know if they want us to come to any of their units specifically. We got quite a few positive responses and it seems that they’re excited about our project as well! So far, all of the RDs at this hospital seem very kind and it is evident that they are eager to help us interns learn and see us succeed – which is really wonderful I must say. This week (as I’m posting this on Tuesday of Week #3), we’re doing lots of literature searching and finalizing our plans for which units we’ll be visiting, for which meals, how many times we will visit them, and when. After we plan out a little schedule, we’re hoping to get up on the units to start out observations. You’ll hear all about this next week! So stay tuned :). 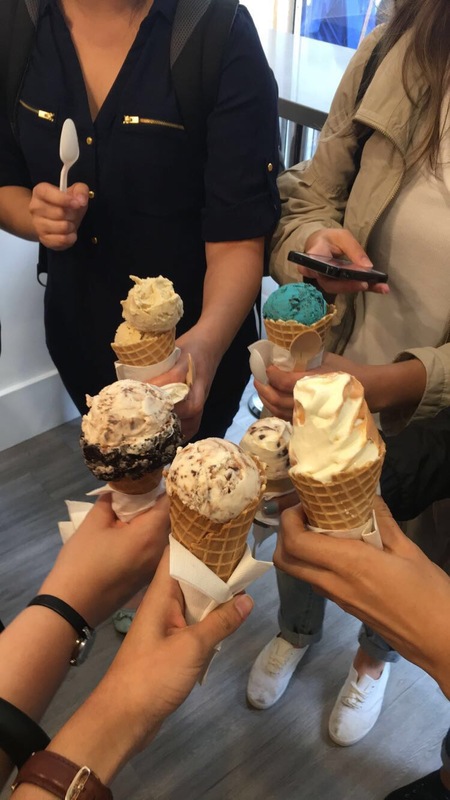 The best part about Week 2 was our intern ice cream date on Friday after work! We went to Fugo Desserts which is a new spot as of this summer and they have some of the most ridiculously good-looking cones I’ve ever seen. We opted for some regular ice cream cones – but I’ll sure be bringing my borfriend back to split the Cookie Monster cone. Check them out if you’re in the Toronto area! That’s about all for my Week #2 of my first rotation, but I thought I’d share with you guys some of my eats from this week too. 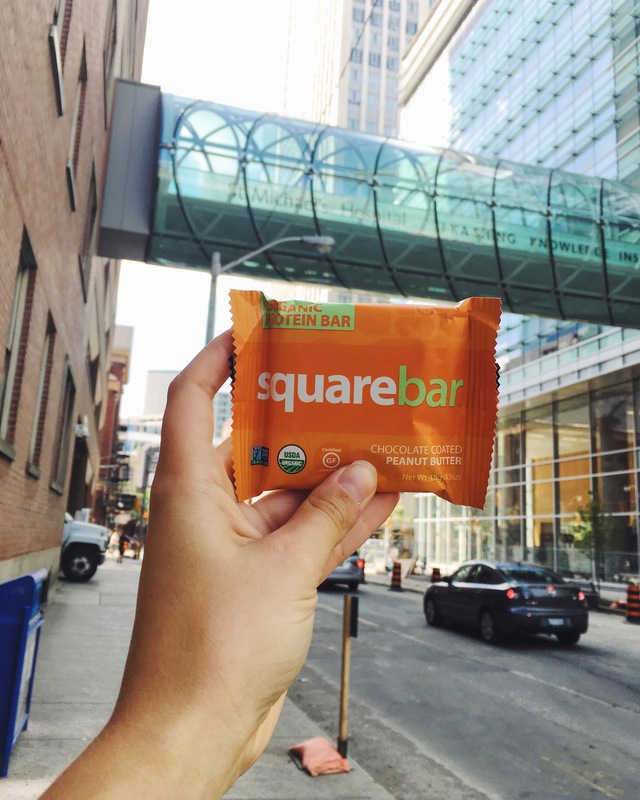 Chocolate Coated PB Square Organics bar – use code “todaywillbedelicious” on their website for 20% off your order! 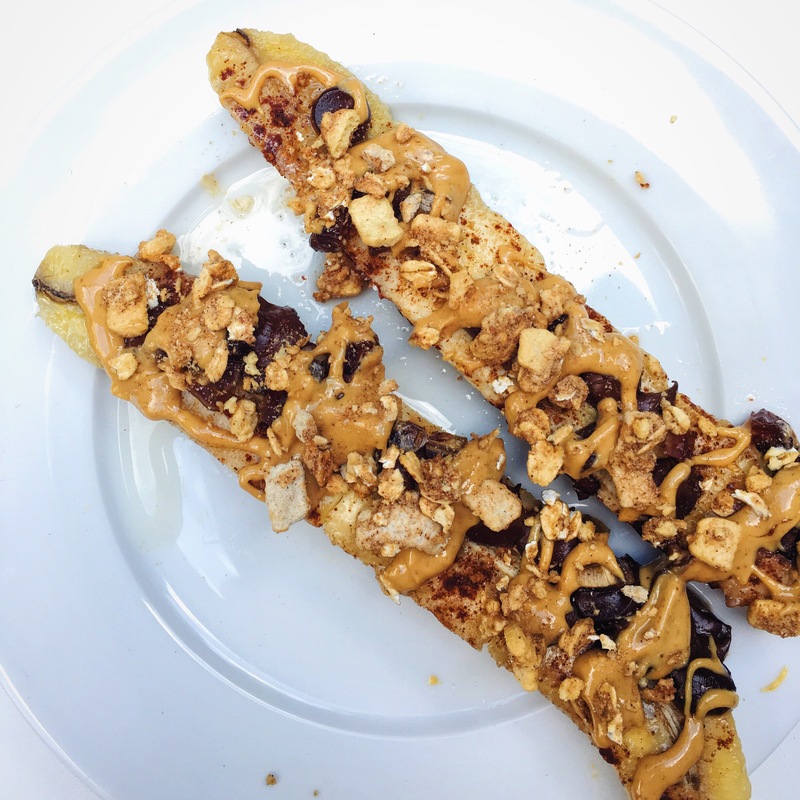 These baked bananas with melted chocolate chips, chopped dates, granola, cinnamon, and melted peanut butter were like dying and going to HEAVEN. 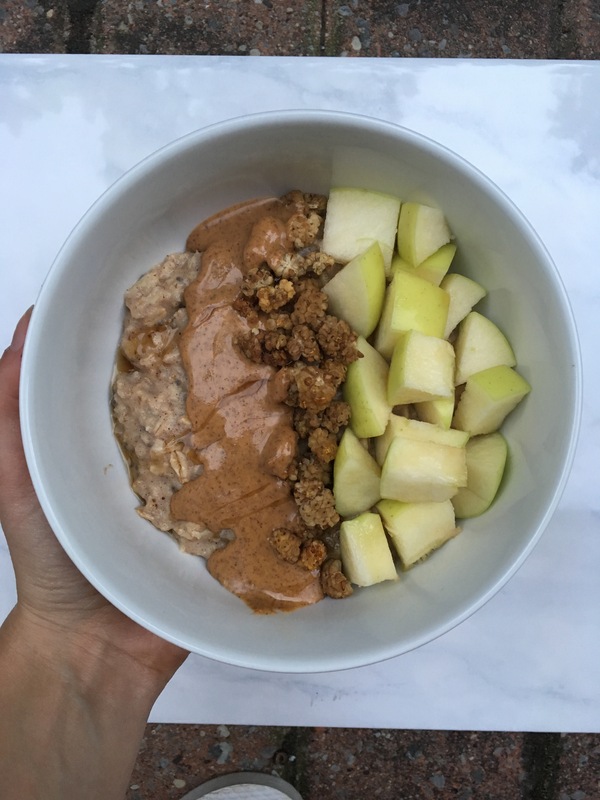 I had this for an afternoon snack one day when I wasn’t feeling the greatest…best afternoon pick me up if you ask me! The full recipe is on my Instagram!